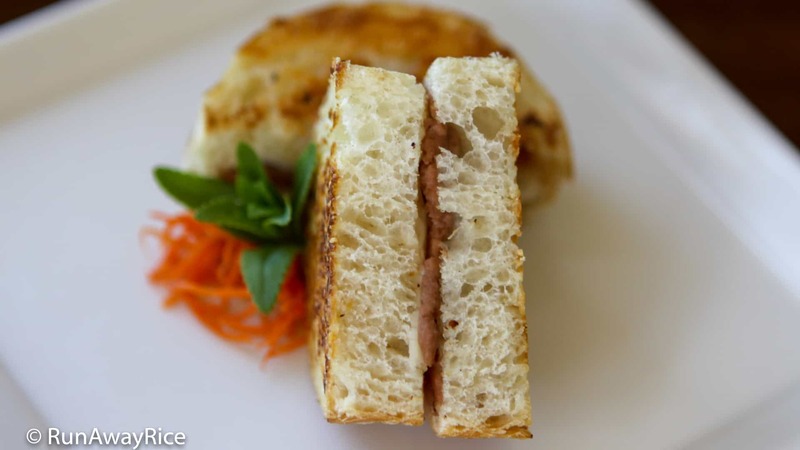 Is there such a thing as a Vietnamese Grilled Cheese Sandwich? Well, maybe not officially…but I love bread, cheese and pate so why not put them together! I always seem to have leftover baguette and pate from making sandwiches and who doesn’t love The Laughing Cow Cheese? (The picture of this happy cow with his own cheese for earrings makes me giggle every time!) This tasty, toasty snack is fast and easy to make. Give it a try and let me know if you like this flavor combo! Sprinkle the grated Parmesan cheese on small plate. Lightly butter one side of each bread slice. Dip the butter side into the grated cheese. Place butter/cheese side down on cutting board. Spread a generous amount of pate on each sandwich half. Spread a generous amount of Swiss cheese on the other half. Assemble the sandwiches putting pate and Swiss cheese sides together. Place in a skillet and cook over Medium heat until the sandwiches are golden brown, approximately 3-4 minutes on each side. Serve immediately.